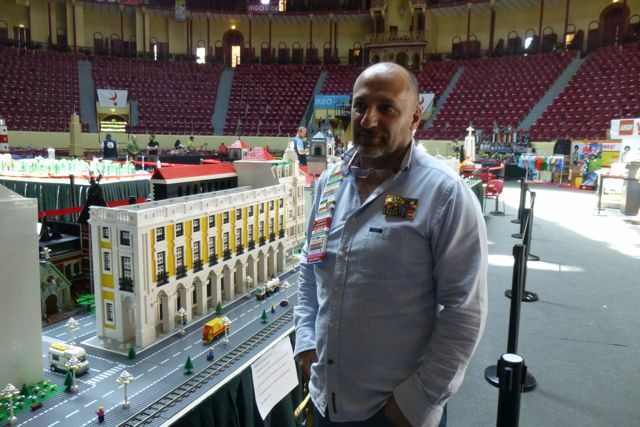 When I lived in Portugal in 2012, I was thoroughly impressed by the creativity of the country’s Lego builders, particularly those who displayed their work for El Corte Inglés’s holiday exhibit and Pedro Nascimento, known for his replicas of the country’s historic landmarks. 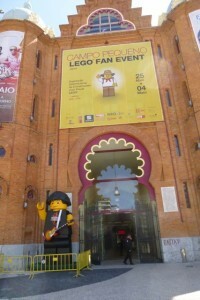 Pedro told me about the annual LEGO Fan Event that takes place in April at Campo Pequeno (itself a historic bullfighting and other entertainment venue). At the time, I didn’t think I’d be able to attend, but our current trip coincided with this event, and I was fortunate to be able to attend twice. The first time I went, Monday April 28, I met Margarida Martinho, famous on Instagram as @alter_lego. She is best known for her 3-panel scenes and was recently chosen to display her work at a prestigious Fusing Cultural Experience multimedia festival in Figueira da Foz. Like me, Margarida prefers to be depicted through her “sig fig” (signature minifigure), and the above banner features her meeting three of my characters — Patricio (with the wine glass, the closest thing to a sig fig that I have), Trendsetter and Hipster. 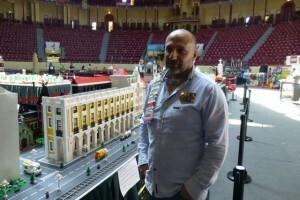 Pedro Nascimento with his model-in-progress of the Terreiro do Paço in Lisbon. 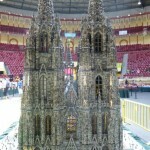 The final product will take 18 months and 6.8 million pieces. 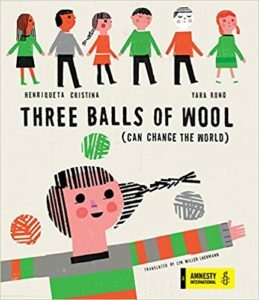 This was Margarida’s first Fan event, but it probably won’t be her last. I introduced her to Pedro Nascimento. 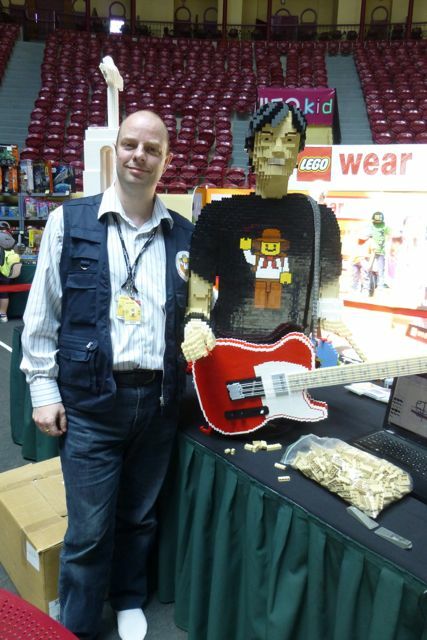 We both met some of the other featured builders, notably the Dutch creator of large models for personal and commercial use, Alex de Jong. We photographed the various giant fantasy, historical, and contemporary dioramas. 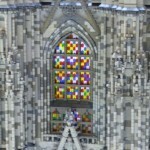 The Cologne Cathedral, built by a German LEGO fan out of one million pieces, was the centerpiece of the exhibit. 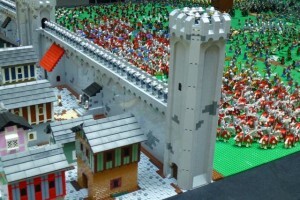 An invading army gathers outside the castle gates while the townspeople go about their business. 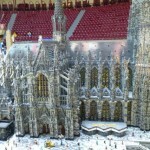 Most of the other exhibits were from Portuguese builders. My friends from France — Francis, Leila, and their 14-year-old daughter Maimounia — who accompanied me the second time I went, on Wednesday, April 30, noted the whimsical scenes and attention to quirky details that characterized the Portuguese builders, as if they weren’t just creating a model but telling a story within that model as well. 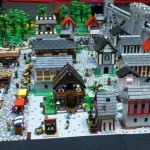 Inside the castle walls, plants and animals feed the townspeople. The town’s denizens enjoy theater and sports. The harbor is on the other side of the trees. The imbedding of storytelling into the creation of mega-scenes and -cities is what attracted me to the Portuguese builders in the first place. 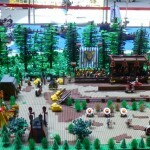 In fact, my favorite display was the medieval castle under siege. 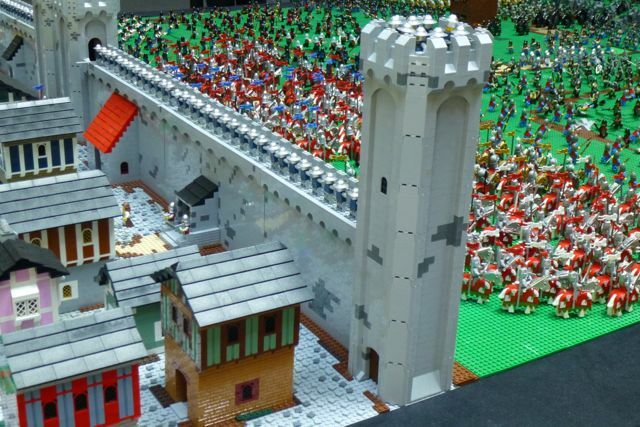 As the army amasses outside the walls, the denizens of the fortified village go about their daily lives, as though pretending nothing is amiss (or not wanting to scare the children). While the army makes its way along wooded trails and ships gather in the harbor, the farmers continue to cultivate the village’s food supply, the sellers set up their market stalls, and the peasant wives and children perform their daily chores. The social and class relations of a feudal community inform my novel ANTS GO MARCHING, so I took extra pictures of the village buildings and tiny peasant homes to use in a potentially non-traditional publication/presentation of the novel. Peasant wives and children perform their chores around their small homes and garden plots. 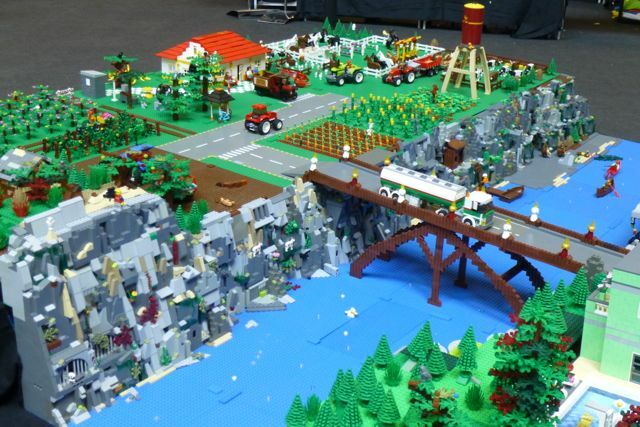 Getting to display at this LEGO Fan Event was highly competitive, as I discovered when I read comments from the members of the Portuguese LEGO Users Group on Facebook. Some of the builders from El Corte Inglés did not make the cut. 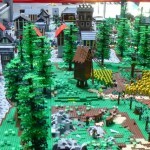 The quality was uniformly high, and as Pedro Nascimento pointed out when I interviewed him in December 2012, most of the dioramas were of cities and highly realistic. The popular Portuguese rock band Xutas & Pontapés made an appearance in one of the mega-cities, as well as in Alex de Jong’s life-size model of lead singer Zé Pedro. 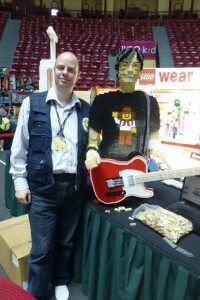 Alex de Jong with his friend Zé Pedro from Xutas & Pontapés. I was pleased to have the opportunity to see Pedro again and learn about his plans for next year’s event. As part of his replicas of Lisbon’s historic buildings, he had a piece of his model of the Terreiro do Paço. Next year, he promises the entire square, depicting the arrival of the Queen to Portugal, a historical recreation that will involve 6.8 million pieces and take up 59 square meters (about the size of a typical one-bedroom apartment). 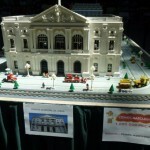 In later years he plans to use his Terreiro do Paço model to portray other historic events. I suggested the assassination of the King and Crown Prince in 1908, an event that led ultimately to the country’s transition from a monarchy to a republic. 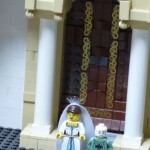 This scene would also offer the opportunity to display Lego blood, which is always a favorite among us Instagrammers. 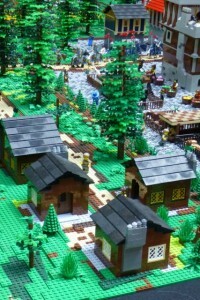 City to Country: A team of four builders created a city based on Porto. The day before we left Lisbon, Richard and I got some great news — that the university that invited him to teach this month wants to have him back next year. Because of our daughter’s college graduation, we didn’t have as much time in Portugal this year and the pace of the course (and of our stay in general) was far more hectic than in 2012. 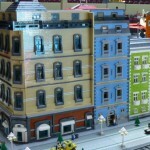 I hope we’ll have more time to travel around the country next year, and, of course, I’m excited about getting to see the debut of Lego Terreiro do Paço at the LEGO Fan Event in 2015. 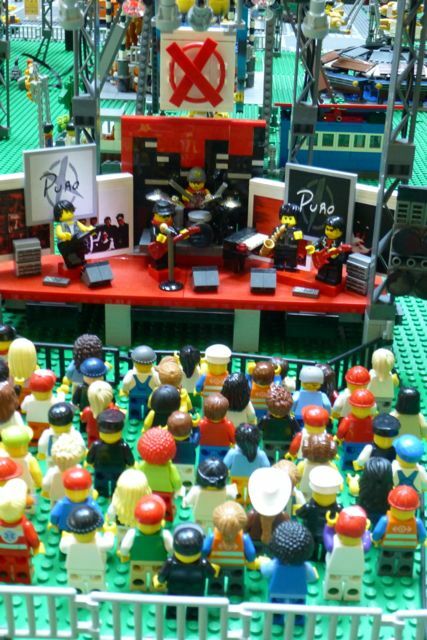 The Portuguese rock band Xutas & Pontapés was a favorite of several builders. The final blog post will be an update of Richard’s highly popular “Dining in Lisbon.” Many thanks to the Fundação Lusa-Americana/Luso-American Foundation for supporting this trip and creating and maintaining life-long relationships between the people of Portugal and the people of the United States. This whole event is impressive. Thanks so much for giving us the insider’s view. Thank you, Sandra! I hope you and Olivia can join me next year. Oh my word! I’m so impressed with these Lego builders, Lyn!!! Such incredible artistry! I’ll have to say their work is intimidating. But if I move to Portugal permanently, I’m going to join the group and go to meetings in the hope of both improving my MOC skills and scripting dioramas for the group to display.